Today is my seventh day participating in October Unprocessed, a challenge from www.EatingRules.com to skip processed food for a month. I have to confess: it's a lot of work for me to avoid all processed food. I've slipped back into some convenience food with my busy schedule since I went back to work, but I've managed to keep up with the challenge so far! I've baked my own bread in my breadmaker and I've provided from-scratch breakfasts, lunches and suppers as well as snacks and even dessert. We've eaten more fruits and vegetables and have wasted less food, produced a lot less trash, and I. feel. great. I don't know if it's a placebo effect or if eating so well is really what's making me feel better. (Or it could be the fantastic fall weather. But I know it's not due to being well-rested. I'm so not!) I have more energy, I'm more patient, and I'm generally happy. I like this. I also weighed myself on day 1 to see if there's any impact on my weight loss. I have a feeling there will be. It's easier when we don't have to go it alone. Some of my online friends are doing October Unprocessed and my friends at work all know that I'm avoiding processed food for the month. 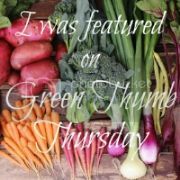 Everyone has been very supportive and has given me great meal ideas. I'll check in next week at my own blog, Farmer's Daughter, but I'll be back here in two weeks to let Green Phone Booth readers find out how it's going. 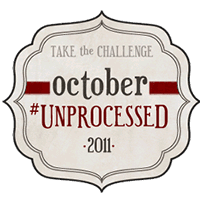 Have you joined the October Unprocessed challenge? What processed food would be hard for you to give up? I tried something like that last year, and it was just too much. Unfortunately, my family needs a couple mornings a week with cold cereal for breakfast and a box of crackers for snacks to preserve my sanity. But considering the amount of processed foods most people eat, I think we're still doing pretty good. This sounds like such a great idea, if only to help one be more conscious about the processed food they are eating (sort of like a Plastic-free challenge I did earlier this year). I wouldn't have trouble with breakfasts, as cold cereal has really not been cutting it for me lately, but snacks would be tough. Also, tortillas. I really don't want to make those from scratch. Coffee - one cup only in the morning but a whole month without it would not be as enjoyable. I agree with Erin. I did this for a couple of years - primarily due to significant food allergies for one of my kids. Eventually he overcame them and, while I was thrilled to introduce the occasional processed snack, I still think we do pretty darn well. Eating all unprocessed all the time in this society is very very challenging. I think it's interesting that you mention being more patient as a result of getting rid of the processed foods... the last 3 days have absurd in my home between kids, the hubs, work, life... instead of reacting like I normally do, I've been peaceful and relaxed. Hmmmm... almost makes me wonder if I'm not allergic to something in the food I'd been eating? My youngest brother is allergic to certain color food dyes and when he consumes something containing that dye, he cannot control himself. His ADHD symptoms are more than obvious... I myself have been saying for the last few weeks that there is no way I don't have adult onset ADD based on how scattered I've been (although there is a slight possibility this is exaggerated by a lack of sleep :D). However, since Saturday and the great purge, I'm a totally different person. Interesting, no? Emerald Apron, I'm curious to know, are you still buying packaged foods, just ones without weird ingredient lists? I already mostly eat that way, but for me the hard thing would be to give up condiments and whatnot. I think a lot of that is because I'm pregnant and only have so much energy to go around, and at some point when my kids are older I hope to be able to do more batches of my own condiments and the like, but at least for the most part, I never cook anything from a box. We're working towards a more primal/paleo diet although I do still let my kids eat cold cereal if they finish all their eggs and yogurt (which is not homemade). @Betsy I wrote about that on my FD blog. I'm making my own bread but buying things I don't have time to make- cheese, pasta, tortillas; or don't have the skill to make, like soy sauce, as long as it passes the kitchen test. This week was still mostly homemade though. And by the way... I lost 2.6 lbs. I now weigh almost 5 lbs LESS than my pre-pregnancy weight, and I had a very hard time losing weight even with Breastfeeding. I've lost more in this one week than I ever did in a single week on weight watchers, and I didn't count or limit anything. I'd still like to lose 10-15 more pounds before I get pregnant again, just for my own health. But I'm pretty amazed that I lost so much in a week, when I have been so conscious about weight for a while. It's not like it was my first week on a diet, but I'm guessing it was water weight due to sodium. I'm doing Unprocessed October and loving it! I have had exceptions - like this evening when I was taken out for dinner, but I tried to pick the less processed foods from the menu (garlic mushrooms and a salad with smoked salmon) although I may have failed when it came to dessert as I had a scoop of ice cream. I feel cleaner inside (if that makes sense) for it and by the morning of day 10 I'd lost 7 lb - although like Farmer's Daughter I think some of that at least was water weight due to less sodium and other junk in my body.